The Universal Motion Simulator can give pilots the sensation of extreme flying inside a fighter jet or even a spacecraft. Some of the world's best combat flight simulators allow military pilots to practice virtual dog-fighting inside a machine that tilts and moves like a mild-mannered theme park ride. To kick things up a notch, a next-generation simulator sits on the end of a huge robotic arm to give trainees the sensation of white-knuckle 6G forces inside a screaming-fast fighter jet. The robotic arm's manhandling of pilots — who also wear 3D-display headsets — can create the immersive experience of doing barrel rolls or pulling extreme turns at high speeds. Such a high-tech simulator could also be configured to simulate spacecraft or hovering helicopters, as well as tanks, trucks, race cars and motorcycles. "This next-generation simulator uses its oversized robot arm to spin users at high speeds in any direction," said Saeid Nahavandi, director of the Centre for Intelligent Systems Research at Deakin University in Australia. "No other simulator can provide the full experience of flying a military jet with all the gut-wrenching G-forces while only seven meters (23 feet) off the ground." Pilot trainees sitting inside the simulator on the oversize robot arm also feel forces and vibrations through the joystick or steering wheel. Such physical sensations combine with the wild spinning ride and the virtual 3D display to complete the immersive experience. Australia's federal innovation minister, Kim Carr, unveiled the new Universal Motion Simulator at Deakin University on Nov. 18. The university received $1.8 million from the Australian Research Council to house the new simulator, and will get an additional $210,000 to begin a flight simulation project in 2012. "What sets the Universal Motion Simulator apart from standard simulators is the integration of haptics technology, which provides a sense of touch and feel to virtual or remote objects, and its ability to move at high speed and in any direction," Nahavandi said. The simulator even has the ability to monitor the pilot's physical and mental health. It uses electroencephalogram technology to gauge the electrical activity of the brain through sensor electrodes, as well as an electrocardiogram to measure pulse and blood pressure. 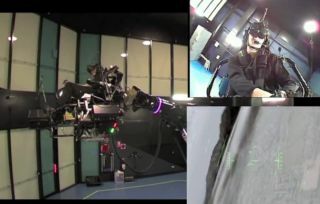 A trainee pilot sitting inside the Universal Motion Simulator can also fly joint simulations with pilots in other parts of the world such as the U.S. by connecting remotely online. But regardless of who proves the better top gun in such an exercise, there won't be any doubts as to which pilot is having the more realistic experience.